BCS Voice & Data Solutions offers computer networking solutions that are scalable, from small businesses with fundamental operating requirements to multi-site enterprises needing in-house IT enhancement. 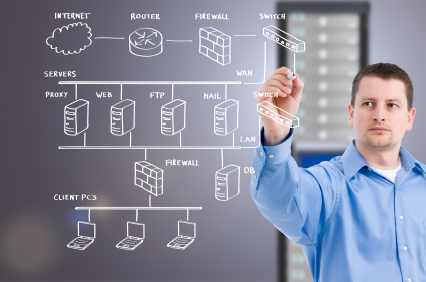 Our staff engineers hold multiple certifications and will promptly respond to your needs, whether it’s maintaining an existing LAN, or creating a scalable computer networking design to bolster your growth and support remote access and WAN expansion. Our proposition to our customers is simple: Choose us and experience how good computer networking solutions can be. We provide network designs and implementation that help promote business growth and innovation, while supporting your infrastructure to minimize the impact from the unexpected. We are always ready to address your computer networking demands, including routing and switching, Voice over Internet Protocol (VoIP) and wireless networking. Data theft is one of the top security risks for any business. By implementing proven security strategies, BCS ensures your network is fully protected. Contact us today for your network needs. Getting an estimate for computer networking services is just a few clicks away.